What a day at the Forward on Climate rally in DC! A determined, passionate crowd estimated at 50,000 strong. 150 bus-loads of citizens from 30 states. 170 partner organizations. Wow. Mama Earth mojo is revving up! Now fast forward from that museum to the rally and related events in DC. Listen to the strong women of the First Nations of Canada describing how their peoples are suffering because of tar sands mining projects. And hear me when I say this: What is happening to them is a holocaust of a different sort, and just as evil. What ever happened to the cry, "Never again!"? And the First Nations are not alone. Think of how many other people and creatures are already suffering due to climate change. They are "expendable," and therefore "killable"--because of humanity's addiction to fossil fuels. 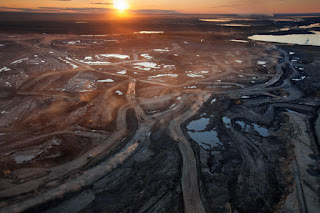 Mother Earth herself is being made a gigantic sacrifice zone, where greed trumps life. Some call this ecocide. We could just as easily call it Earth holocaust. We dare not accept that, my friends. What I know now that I didn't know yesterday is that tar sands mining is even more devastating than I thought. The depth of my moral outrage at this point seems bottomless. But my commitment to defending the Earth and her inhabitants, and my ability to do just that, are also bottomless--not because of any special gifts I have, but because like you, I AM SOMEBODY. And because I am Somebody, I can do Something. And I am not alone. The numbers of people wanting to protect the Earth are surging, and we've got tremendous power. We may not have money, but we've got the truth, and we've got to wield the truth like a sword. The truth can overcome anything, but we've got to pick it up and use it.